This year brought us the opportunity to reach a diverse audience seeking environmental and ecological knowledge. 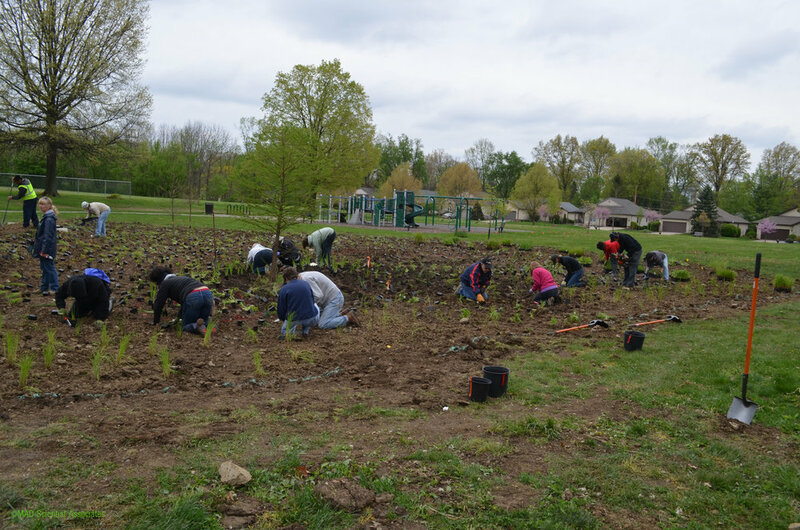 We had the pleasure of working with local elementary-middle schools, City of Columbus High Schools, college students, as well as individuals and organizations that participated in several community projects. 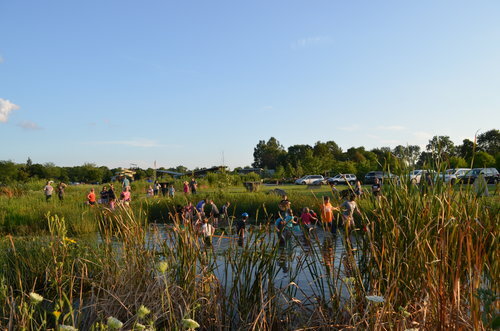 Activities included team-building games, wetland exploration, planting and invasive species control, science fair displays, and wetland illustration assistance. 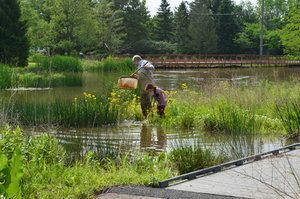 Wetlands can be fun learning environments for people of all ages! 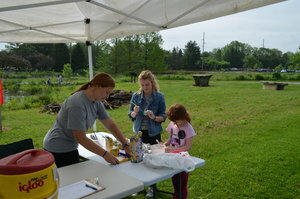 Wetland exploration activity at Blacklick Woods 70th anniversary party. 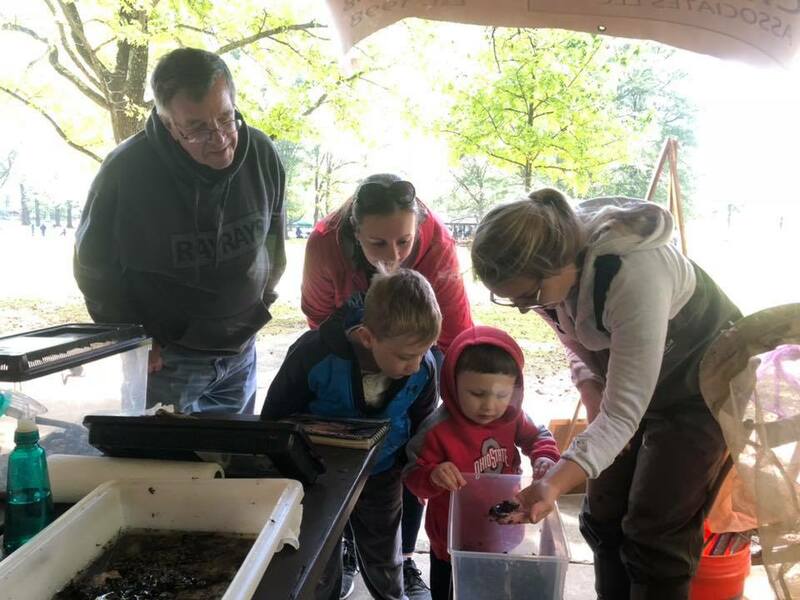 MAD Scientist Associates is always happy to team with the City of Westerville Parks & Recreation Department to connect with the community in sharing about wetlands and the natural wonders held within sites like Highlands Park. 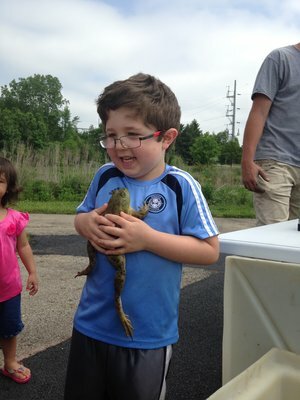 On Friday, May 18, the third of our Frog Friday events was held, and nearly 100 community members of all ages came out to learn about the frogs on site: American toad (Anaxarus americanus) adults and tadpoles, bullfrog (Ranas catesbeiana), green frog (Ranas clamitans), and gray treefrogs (Hyla versicolor). Toad tadpoles were also seen in abundance, and a large mass of gray treefrog eggs were observed. 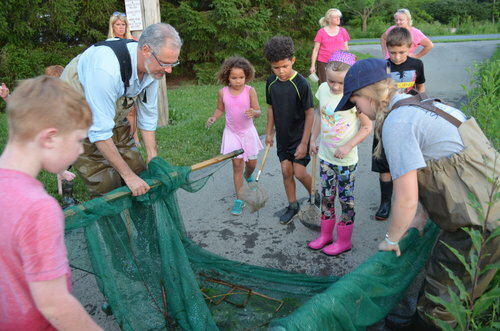 MAD provided nets that children used to collect frogs for closer observation (then released them). 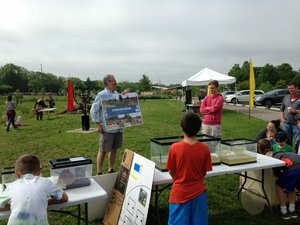 On Saturday of the Wetland Weekend, we hosted our annual Wetland Workshop, also at Highlands Park. Mark Dilley welcomed the 75 attendees and gave them a brief introduction to wetlands and their importance to our drinking water and overall ecosystem. 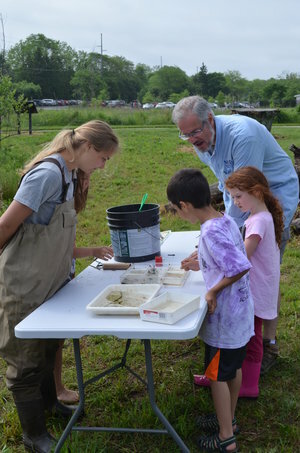 MAD staff members and interns hosted stations around the wetlands to help visitors learn about its various aspects: soils, amphibians, invertebrates, and wildlife. 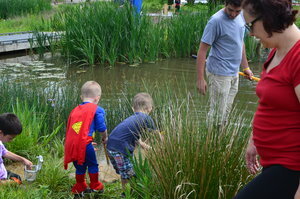 Exploration was also encouraged, allowing participants to wade into the nature play area wetlands to use small nets to discover the life forms below the water. Some notable wildlife observations include: mallard ducks (Anas platyrhynchos), and great blue heron (Ardea herodias), and a nesting blue bird pair (Sialia sialis). The rain caused us to wrap up a bit early, but a lot of fun and learning took place! A big thanks to Schneider's Bakery for donating a box of doughnuts for our event participants to enjoy. 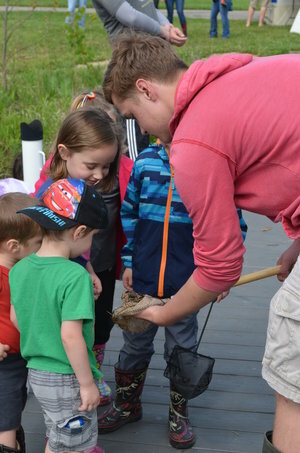 Watch our events calendar next May to join in the Wetland Weekend fun! Collaboration can accomplish great things. Debra Knapke, of Columbus State Community College, headed this wetland creation project at Sharon Meadows Park, owned by the City of Columbus. The Park (site) previously housed the Sharon School building. The 10-acre park features open space, ballfields, a playground, and a paved walking path. 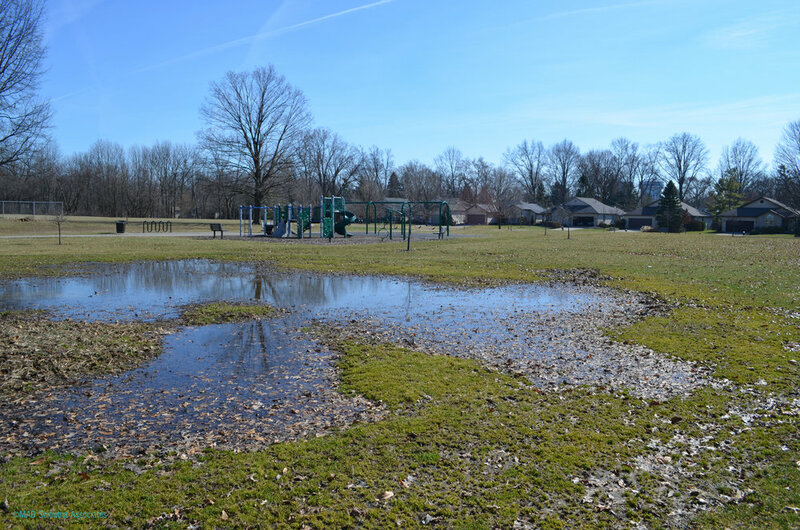 Several low-lying areas near the playground were periodically flooded, making them unusable and unattractive. Mark and Daniel completed a soil assessment and topographic survey and determined that a wetland creation project would be possible. Planning and design work was completed in part by BrightView, Columbus State, Friends of the Lower Olentangy Watershed (FLOW), and MAD. 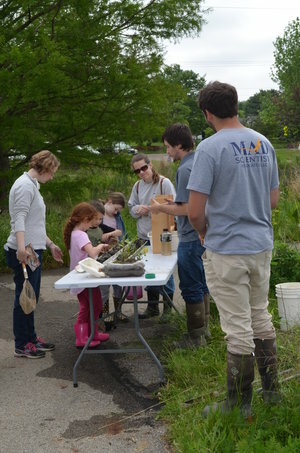 Columbus State students and faculty, members of the Sharon Heights Community Association, and MAD staff helped plant the newly constructed wetland, which include sedge meadow, emergent marsh, and scrub-shrub zones. The Clintonville Fire Department arrived after the planting to literally hose down the wetland. It was quite the spectacle! Park guests are encouraged to explore the new wetland using the mulched walking path and enjoy unique vantage points from rock slabs. The project was largely funded by U.S. and Ohio EPA grants. Click HERE to see a video about the project! 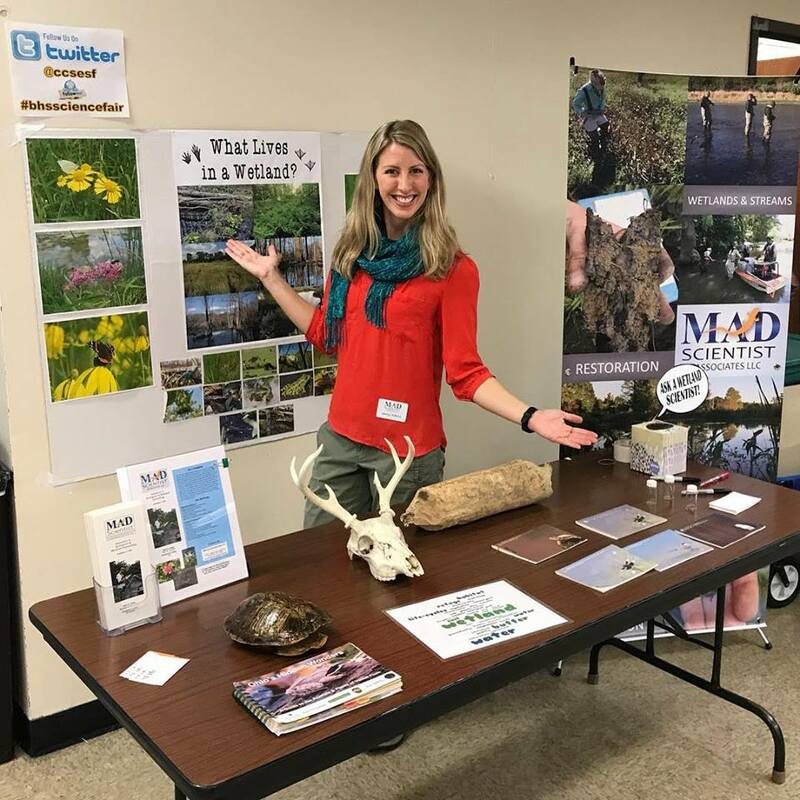 MAD has been working with the Greenacres Foundation, a non-profit environmental education and sustainable farming organization in Cincinnati, Ohio, on two exciting wetland projects. Earlier this year, MAD designed and oversaw the construction of a treatment wetland to reduce nutrients in runoff from within and around their cattle weight house. 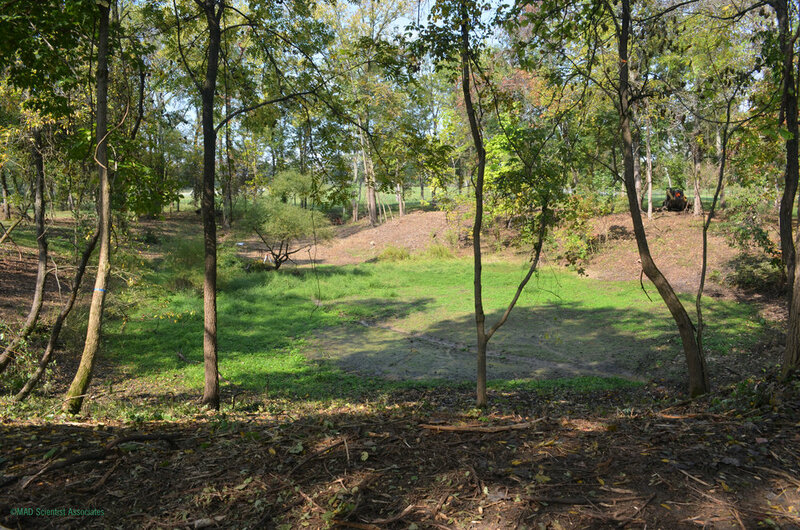 A multi-cell wetland system was created to encourage sedimentation, colloid removal, nutrient sequestration (in plants and soils), and infiltration, before this facility runoff enters a tributary feeding Sycamore Creek. We are also pleased to report that Greenacres has broken ground on another wetland project near their education building. This one, a failed farm pond, turned emergent marsh, will be restored and expanded for Greenacres to use as an outdoor education site. 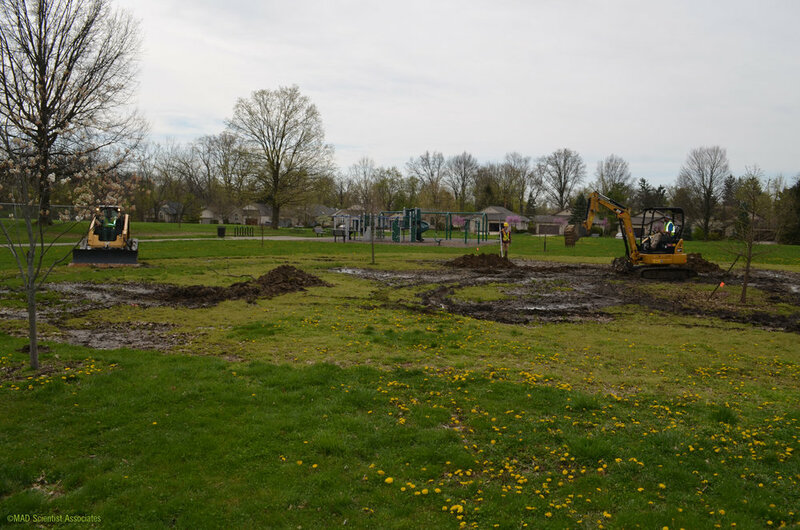 Our team is working closely with Greenacres' staff to build and plant a wetland that is accessible for student use, and will provide improved water quality and wildlife habitat functions. A bioretention basin at the upstream end of the wetland drainage will receive pasture runoff before entering the marsh. This basin will feature an exposed concrete wall with a glass window that will allow students to get a unique view of the soil profile. As part of their sustainable practices, much of the plant material for this wetland will be grown in-house, or locally sourced. Click the video GO button below to see how fast our team works! 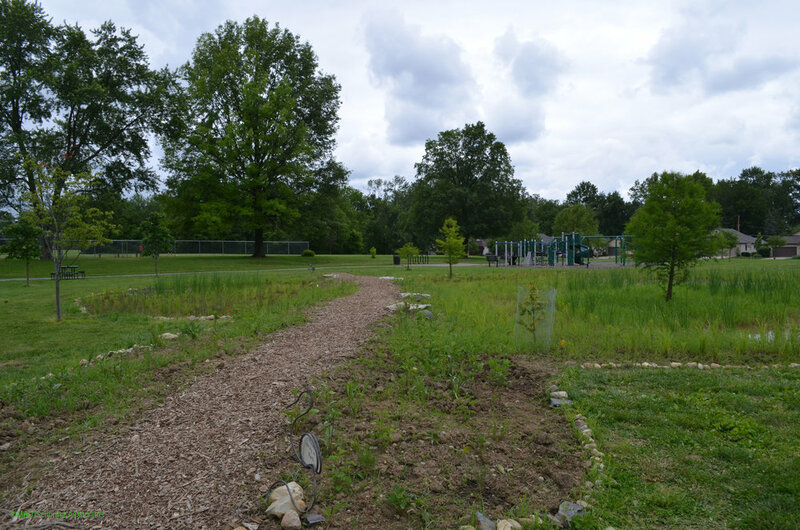 Etna Elementary School (grades 4-5) hired MAD to enhance their existing outdoor classroom through the addition of created wetlands and additional native habitats. The original area included mowed paths and a meeting area surrounded by unmowed turf grass. 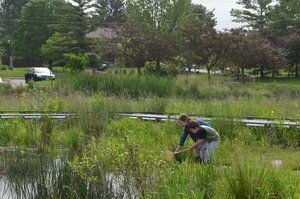 The Etna teachers were specifically interested in improving the existing low-quality emergent wetland, and add native habitat areas, such as hardwood forest, tall-grass prairie, and scrub-shrub wetland. 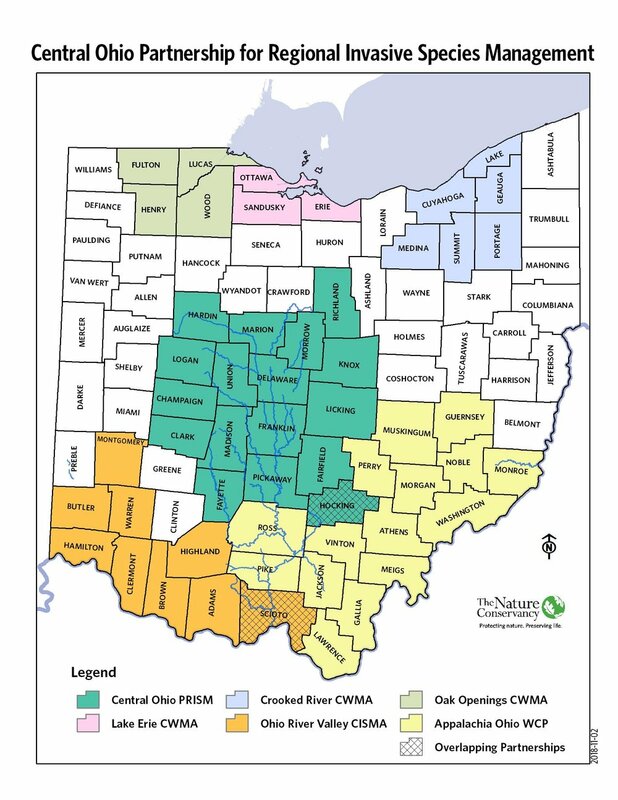 MAD completed a wetland delineation and obtained approval for the project with the Ohio EPA. Thanks to a motivated team and a helpful Etna parent, earthwork began in late April and was finished in August. The team is hard at work applying for grants to complete the project. The Southwest Licking Local School District is eager to have this one-of-a-kind outdoor classroom ready for school use! 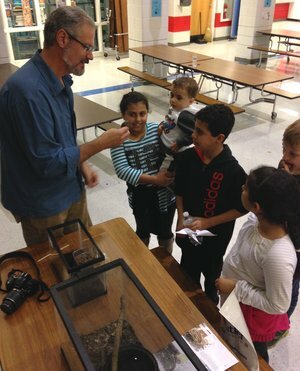 In 2016, Frog Fridays began as a fun way to get the community involved in wetland exploration when amphibian activity is at its peak, and Mark had a free Friday evening. Since then, they have evolved into regular events hosted by the City of Westerville Parks and Rec. department with attendance records exceeding 100! Events were held periodically on Friday evenings from 7:45 to 9:00 pm. 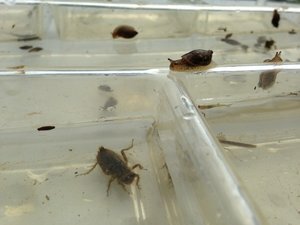 MAD provided amphibians and macroinvertebrates for viewing, as well as sampling equipment for participants to use while exploring the wetland. Frequently observed wildlife include American toads, green frogs, bullfrogs, and gray treefrogs. Oftentimes participants saw the silhouettes of mallards and great blue herons flying in to roost for the night, as well as bats and swallows who emerge in the evening to eat flying insects. We had a few unfortunate weather events that caused events to end early or be postponed, but we were amazed that diehard amphibian fans were undeterred by cold, rain, and on one occasion, lightning! Wetland Weekend 2017 - Great turnout and great weather! 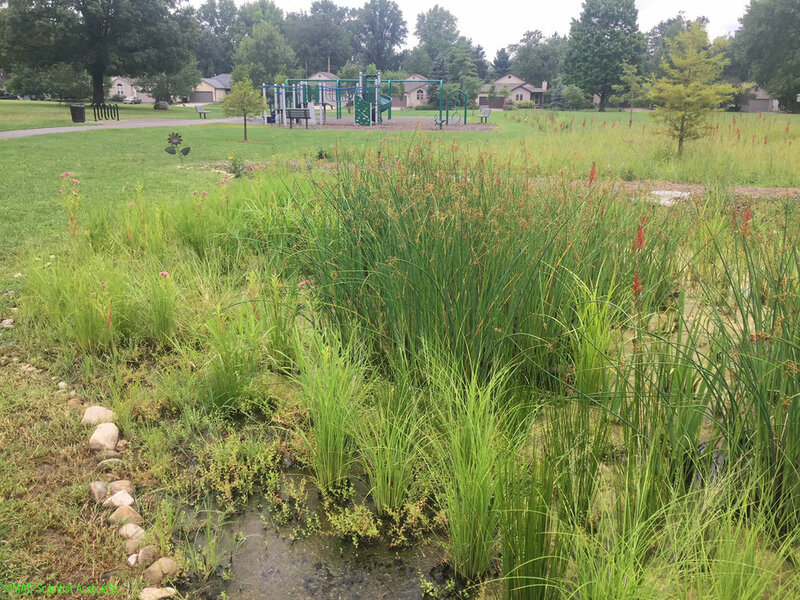 The City of Westerville City Council proclaimed May 2017 as National Wetlands Month and called upon all citizens of Westerville to aid in the continuing efforts to preserve our valuable wetland resources. 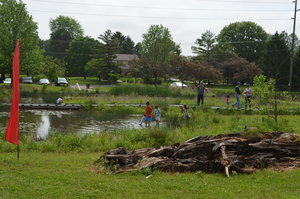 In celebration of wetlands, Westerville Parks & Recreations Dept. 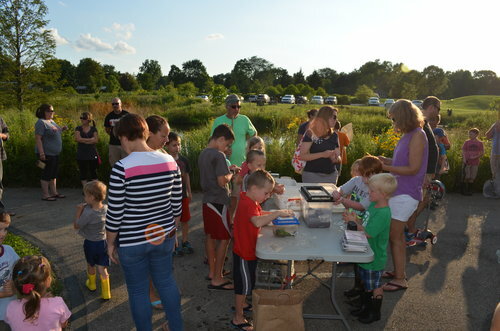 and MAD Scientist Associates held its 17th annual Wetland Workshop on Sat., May 20, preceded by a Frog Friday on May 19, the night before. Both events were well-attended, with over 70 participants in Saturday's Wetland Workshop. In addition to the City, we would like to thank Schneider's Bakery for their doughnuts and Starbucks on Polaris Parkway for the coffee donations! As you can see in the photos below, great fun was had by all! 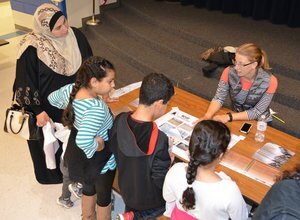 The McVay Elementary PTA put on a fantastic Science Night event on Wednesday, November 16th. 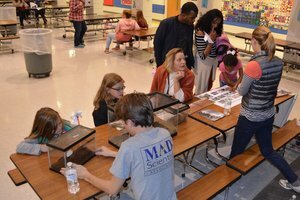 MAD Scientist Associates was happy to participate, not just because we love Science Nights, but because we were able to talk with students, parents, and teachers about the vernal pool enhancement project (completed in 2015). 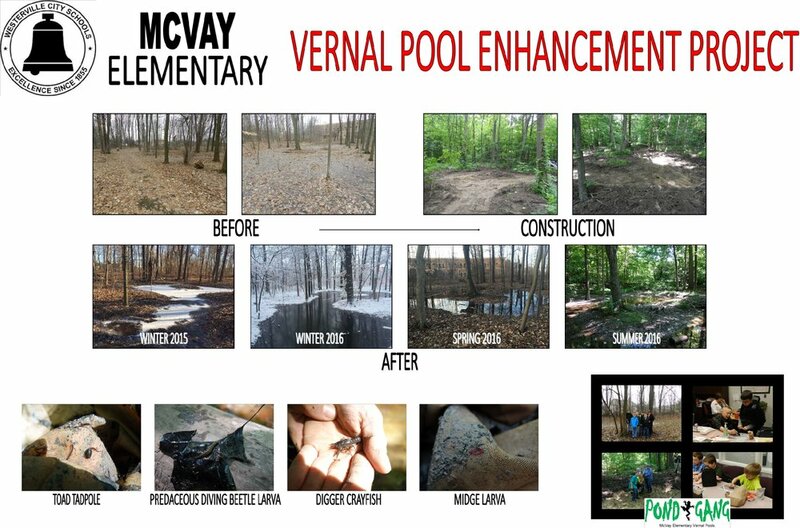 It was great to hear reports of use from students and community members, and to have an opportunity to discuss the unique functioning of vernal pools. 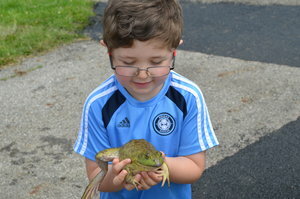 Oh, and participants also loved seeing our edu-animals, all of which could be found in Ohio vernal pools! We also wanted to thank the Ohio Department of Natural Resources for providing wildlife field guides for our events. 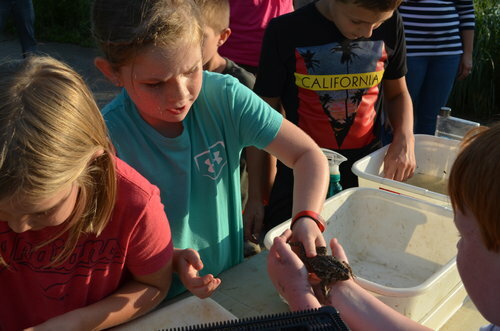 We love giving kids a hands-on experience with live animals and sending them home with guides to learn more about Ohio's native wildlife!